In this article I am going to write about this one photo that I took on my photographic trip to Santorini. There is one very simple reason why this is one of my best photos of Santorini – when I look at the image it brings back to me so clearly being there – I can almost feel like I am there. And that for me is the point of travel photography – to make you want to be there, or bring back the memories of being there when you took the photo. When I say one of my best photos of Santorini I mean just that – one of the best photos taken by me. I have never seen such a scene before when I get up in the morning. This was our first morning in Santorini, and I had missedthe sunrise. Well we had just got there to be fair so this was the first morning. The first I knew about all this funky weather stuff going on was when my wife shouted out in surprise after opening the curtains! Neither of us expected this! A blanket of cloud immediately below us and that gorgeous orange morning light. I love the contrast of the colours and the uniqueness of this scene – that lovely surreal grey cloud not where it should be – i.e. down below and not up in the sky! And I also love the fact that this photo was taken at the hotel that we stayed at – my wife spent a lot of time choosing this exact hotel for my photographic trip to Santorini. This was the kind of thing I was hoping for – stunning views including the white buildings of Santorini. This photo is one of the 20 images featured on my travel photography website Photos of Santorini. 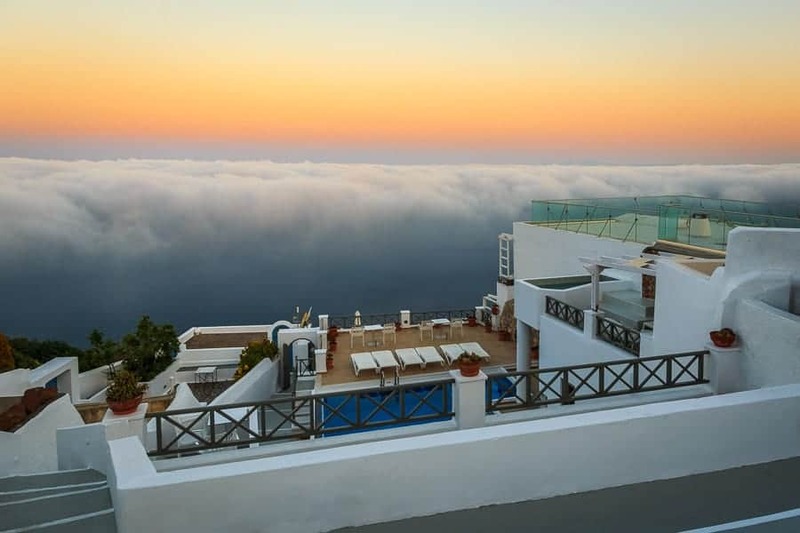 The hotel we were stopping at is in the town of Imerovigli, located on the top of the Santorini caldera and a fantastic base for a photography trip. 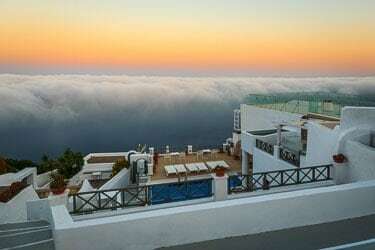 Imerovigli is within walking distance of the capital, Fira. And for those of you who don’t know about Santorini, which it is rude to assume, Santorini is a Greek Island formed by a volcanic eruption years age. 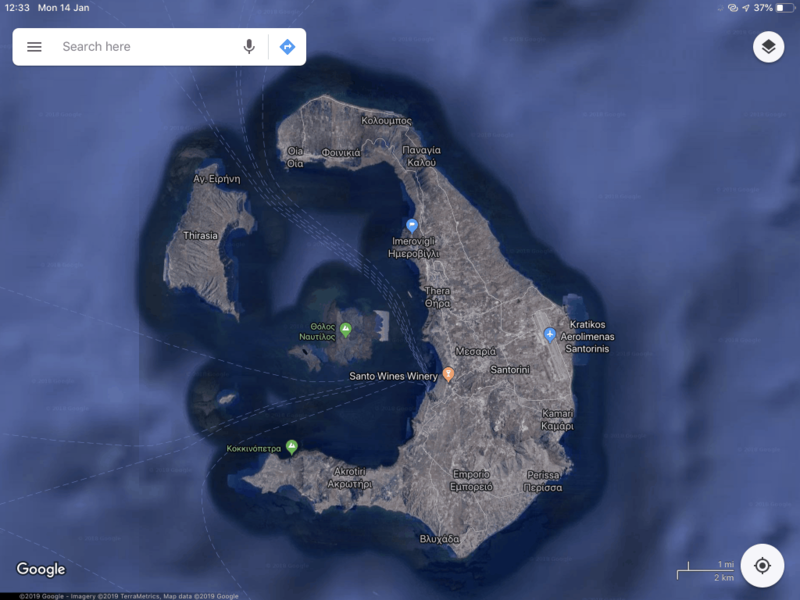 Where I took the photo from is identified by the blue flag on the screen shot from Google Maps. Look at the shape of the island you will see that the water in the middle is the centre of the volcano, and this unique topography gives fantastic photographic opportunities. Getting back to the photo, this is the view from the back of the Kasimatis Suites. This is a panoramic shot taken with my iPhone. I use the large screen on my iPhone to help me with compositions. The screen on my iPhone 7 Plus is significantly better than the screen on my Canon 6D. I quickly walked round the hotel looking for my composition. One shot that I did try was from the very bottom of the hotel looking down, but this didn't make any sense. I needed some of the hotel in the shot to give the composition context. Clouds are clouds after all, and are found all over the world. Looking down on clouds really does not work!! I settled on the view you can see in the main image on this post which is telling the story of a morning at a hotel on the Greek Island of Santorini. A sunrise morning with low clouds that is. Now I know that this is not unique but neither is it a daily occurrence either. Right there where the Red Cross is. This is the Kasimatis Suites in Imerovigli on the Greek Island of Santorini. This is a screenshot from Lightrooms Map Module. The combination of the GPS on my Canon 6D and the Map Module Look in Lightroom are very useful tools for me, as I take photos all over the place. 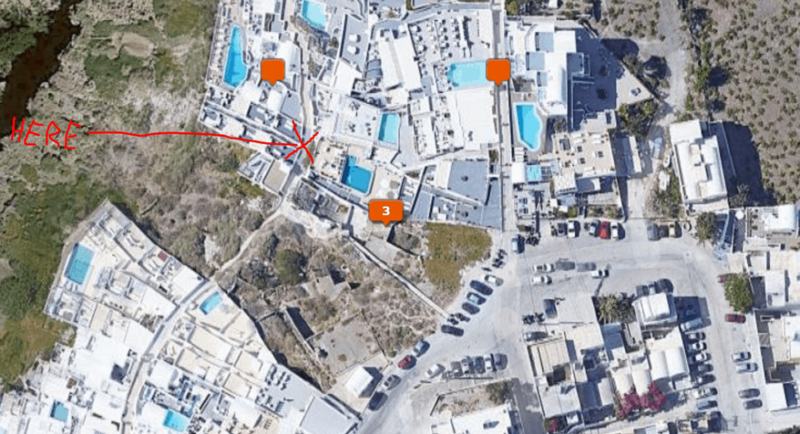 The Map Module in Lightroom is so detailed you can see the swimming pool, and exactly where I took this photo! What photography gear did I use to get the shot? Red shoes – fresh on! What camera settings did I use to get this shot? Shutter speeds 1/250th second, 1/1000th second and 1/60th second. You can see what this all looks on this low quality video taken with my iPhone, with accompanying early morning sounds! This one took a little while to produce in Lightroom – not too long. Sometimes edits are nice and quick, sometimes not so. The first job was to merge the three bracketed images together in Lightroom to form a new Dng file. Next thing I always do is to get the verticals and horizontals correct, and crop the image on the rare occasions that a crop is required. After that I always do white balance. I do these thing first so that I am working on the actual composition I want, and with the right colours – a technically accurate starting point for the more creative processing. Most of the work was done in the Basic and HSL panels in Lightroom, which is normally the case for me – see the screenshot above. By the way, I apply some processing on import of images into Lightroom, including a subtle vignette, sharpening and profile corrections. There was quite a bit of cleaning up to do, removing blemishes, dust spots and random bits of lights and stuff in the building that were detracting from the scene. This is what I use Photoshop for, and not much else! What could I have done to improve the image? Something I am doing more often now is actually looking at the finished image. I do this a few days after the edit. And what did I miss? I need to get rid of that bit of wall bottom right – I only just noticed this writing this article! And that is the point of me asking this question – it forces me to look at the images I have created and see what is in there that I don't like, and think about ways that I could have created a better image. I recommend everyone does this who wants to improve their phototgraphy – even better get someone else to do this for you. Not your family of friends – they will just say that they think your photos are great even if they are rubbish! Better to ask someone who knows what they are talking about who will be brutally honest with you. My first critique was with a Hasselblad Master who was also my BIPP mentor! I have never seen weather like this before. And I am quite old! I have never looked down on clouds from my hotel room, especially with a big bright band of sunrise light above the clouds. This scene was absolutely surreal and stunning, and a scene that I will not forget in a long time. I am happy that this image brings back those memories of that morning – this is why I love photography so much. And also why I want to go back to wonderful Santorini. Then again there are so many other places on this wonderful planet of ours. Let me know what you think, even if it is to tell me that I have been speaking a load of rubbish!